RICHARD HEELIS. We have identified the most likely father of William Heelis, yeoman of Skibeden, as Richard Heelis of Draughton, another township in Skipton parish. Richard was the youngest son of William Heelis of Draughton and his wife Maude. He was a late child of this marriage, born in 1621, towards the end of the reign of the first Stuart king James I. 1621 Nov 4. Richarde the sonne of Wm Helesse. Draughton was then a hamlet, 3 miles east of Skipton, above the River Wharfe. Belief in witchcraft was common then. Witch stones (river pebble with a hole in them) were belived to ward them off. Even recently there was at least one house in Draughton with a witch hanging by the front door. Richard’s son William became a yeoman farmer. It is likely that Richard was also one. His father died in 1637 and Richard may have taken on a tenancy then. He was 20 in 1642 when the Civil War broke out. 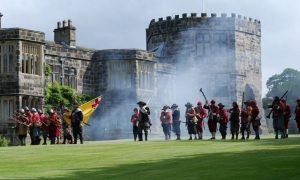 The Cliffords of Skipton Castle, who owned many of the tenanted farms in the area, were stoutly Royalist. Tenants were marched away to fight for King Charles, regardless of their personal loyalties. A young man like Richard might well have fought on the Royalist side. This may be why he did not marry until he was around 30. We do not have a record of Richard’s first marriage, but we know from the burial register that his wife’s name was Jane. From the baptism register we assume that they must have married in the early 1650s. This was the start of the Commonwealth republic following the civil war. Marriages were recorded by a civil registrar and may not show up in the parish register. 1656 Mar 27 Richard the son of Richard Heelis of Draughton. 1658/9 Mar 9 William the sonne of Richard Heelis of Draughton. Ten days after his birth, on Mar 19, Jane the wife of Richard Heles of Draughton was buried at Holy Trinity, Skipton. The baby William was buried the following month on 14 Apr 1659. Another six children were born. Following the Restoration of the Monarchy in 1660, the Skipton register returned to recording baptisms, rather than births. Jann was buried two months later on 22 Aug.
Another child of Richard Heelllis of Draughton was buried on 31 Mar 1668, unbaptised. It must have died before or at its birth, since emergency baptisms were carried out by lay people if the baby was not expected to live. On 30 Sep 1666, Elizabeth Heelis of Draughton was buried. Richard’s eldest daughter would have been 13 at the time. We should expect her to have been recorded as his child. This may be an older Elizabeth. Eighteen years later Richard’s wife Ann died. We have not found Richard’s burial, but it must have happened after 1684.